With the wide range of portable charcoal grills available today, choosing the best one for your purposes may be a daunting task. That’s especially true if you don’t know what to look for, and more so if you don’t know where to look. We will make the hunt for the best portable charcoal grill a lot easier. Our portable charcoal grill reviews cater to anyone, may you be a camping enthusiast or just someone looking for a good portable grill for BBQ in your back yard. The Weber 10020 Smokey Joe 14-Inch Portable Grill is an ideal grill for camping and outdoor activity. It is a circular grill with a 14.5-inch diameter, giving a cooking area of 165 square inches. The outside surfaces are porcelain-enameled to protect against fading and weathering. The grill grate is also triple-nickel plated to prevent rusting. Weighing at just 4.3 kg, it is very lightweight, and thus easy to bring anywhere. And an ash catcher at the bottom makes cleanup a lot easier after grilling. Above the ash catcher is a bottom vent for additional temperature control. This can get clogged with charcoal debris, though. But the top vent on the lid should compensate enough, should the bottom vent be clogged. This bottom vent also has an extra role – extinguishing the coals. Just close the vent to kill the coal fires once you’re done grilling. This can save you on charcoal costs, because you can reuse old coals if they’re still viable. The grill grate has enough space for six burgers or three steaks. The Smokey Joe also includes a lid, so you can lock in the heat for better cooking. The lid is vented, too. The top vent on the lid is adjustable for better temperature and airflow control. The vent is rust-resistant as well, just like the rest of the grill. And when you need to check the food from time to time, it won’t be a problem. The lid features a glass-reinforced nylon handle that stays cool even while the grill is hot. Since the grill grates are made of steel, heating would take longer than in a cast-iron grill. However, the cooking performance isn’t that bad. Once the grill is hot enough, it can still give out great burgers, steaks, sausages, and others. And there are vents anyway, so you can adjust the temperature as needed. The Weber Jumbo Joe 18” Portable Grill is great for those looking for a large cooking area in an outdoor grill. 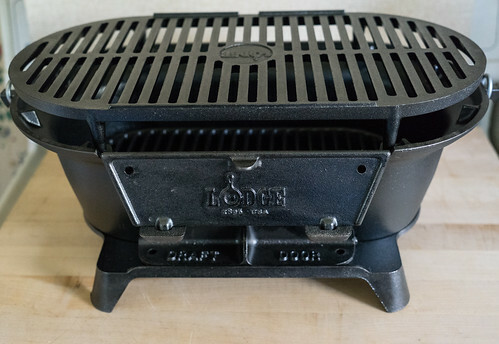 The Jumbo Joe is equipped with a steel cooking grate 18.5 inches in diameter. That’s enough room for your steaks, vegetables, sausages, and others. This sits on top of a porcelain bowl with 240 square inches of area. Of course, it’s complete with a lid to top it off. For those worried about messy charcoal ash, that won’t be a problem either. The Weber Jumbo Joe includes an ash catcher made of aluminum. This means it’s lightweight yet strong. This ash catcher doesn’t add much weight to the grill, but it does the job well. The dampers on the edges of the ash catcher are also aluminum, as well as the top vent. They’re rust-resistant, so no worries if ever they get wet. ​The Jumbo Joe also comes with a glass-reinforced nylon handle. It may look thin but it’s strong enough to lift the entire thing. On the lid also is an ergonomic handle lined with a heat shield. Taking the lid out while the food is hot will not be a problem. And if you want to keep the lid open while grilling, it won’t be such a chore. The lid can be locked in an open position when you need it to. Once you’re done, just unlock, close the lid, lock it closed, and carry. The Jumbo Joe also isn’t that jumbo in terms of weight – it’s only at about 11 kg. The Weber 121020 Go-Anywhere Charcoal Grill is, as the name suggests, very easy to take with you anywhere. It is made of cast-iron, making it durable and sturdy. The outside surfaces are also porcelain-coated to protect against rust and the elements. Weighing at only 6.7 kg, this grill is fairly compact. Even then, it has a wide 160 square inches of total cooking area. The grill grate can fit up to 6 burgers or 2 large steaks. ​The cooking grate is rectangular and made of plated steel. It distributes heat well and is also rust-resistant. The grill also includes a lid for when you want to lock in the heat. The lid has a glass-reinforced nylon handle, shielding it from heat. You can easily lift the lid out and put it back even while cooking. ​The Weber 121020 also features a good level of temperature control. It has 2 adjustable dampers to regulate air flow, and each damper has 3 vent holes. That should help keep your burgers, sausages, and steaks from getting overcooked, or worse, burnt. ​This grill has two plated steel legs to hold it in place. The legs are sturdy, plus they are foldable for easier transport. When folded, the legs also hold the lid securely in place. And being made of the same material as the grill grate (plated steel), the legs are also protected from rust. Setting up the Weber 121020 is also a breeze. Just fold out the legs, lock them into place, and it’s ready to go. The Char-Broil Portable Tabletop Charcoal Grill is a nice, portable, easy-to-use grill for anyone. It has 187 square inches of cooking area, enough for up to 8 burgers. The grill is chrome-plated metal, protecting it against rust while assisting in faster heating. The lines on the grill are not too far apart, which is a nice feature. This means you can cook small slices of meat as well as large steaks without anything falling into the pan. Small slices of vegetables and other food items will also cook without a hitch. The chrome-coated grill wires are easy to clean as well. No need for excessive scrubbing. The grill does come with a lid too, so you can seal in the heat for faster cooking. The rectangular pan is 12.6 inches deep, so the charcoal is not too close to the food. The pan also has much room for charcoal, so cooking won’t take too long. Adjustable air dampers are also present to allow temperature control. Of course, no one wants to overcooked or undercooked their food, so this feature is essential. ​If you’re using the lid, the handle is also ergonomic, and has heat shielding. This way, you won’t scald your hands when lifting the lid while it’s hot. There are also side handles in the grill, making it easy to carry with or without the lid. And the legs are foldable, making the Char-Broil very easy to transport. Once you’re done, just fold the legs up and it’s good to go. As for weight, the Char-Broil is actually very light, at just 4.2 kilograms. Practically anyone can carry this grill. The Lodge L410 Pre-Seasoned Sportsman’s Charcoal Grill is a portable, yet sturdy, hibachi-type grill. It is made of cast-iron, which makes it very durable. It’s ideal for car camping, picnics, tailgating, even in the patio or out in the yard. The cooking grate measures 17.25” x 9”, giving a total cooking area of 155.25 square inches. Also, the grate is pre-seasoned, and thus ready to use right out of the box. Charcoal goes in through a flip-down door for easy access. The Lodge L410 also has two levels of temperature control: One is through a draft door, and another is through the two adjustable heights of the grill. It also does not include a lid. The grill is pre-seasoned, so you can use it right out of the box. Also, no assembly is required. All you have to do is place the grill on top, and it’s good to go. No need to whip up anything from the toolbox. It can be hand-washed as well, but there are specific instructions for maintenance. Make sure to follow those, otherwise the grill could be easily damaged. Also, the grill must be re-seasoned every now and then. That aside, if you follow the instructions properly, the Lodge L410 will serve you a good number of years. ​Cooking performance is also good on the Lodge L410. The wide area can accommodate whole fish, steaks, burgers, and many others for a number of people. The spacing between the grates also isn’t too wide, so no need to worry about food falling into them. The grill is also flat, allowing you to use small pots, pans, and skillets on the grill. Heating is also mostly even on the entire area of the grill. Also, it stays warm for a while even after the coal fires are put out. This way, you can keep any remaining food warm for longer.